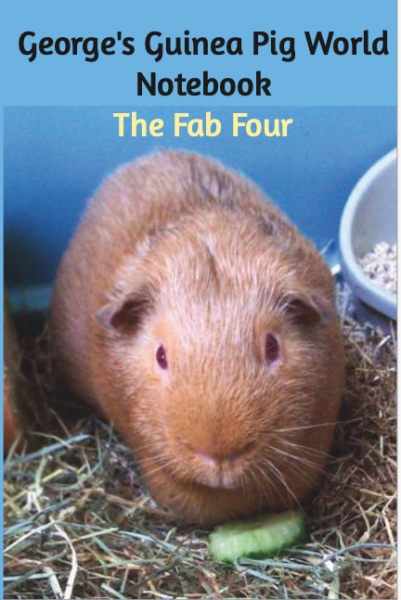 I'm a guinea pig from Newcastle, and proud of it! My bestie is Neville and we moved to Norfolk in 2017. 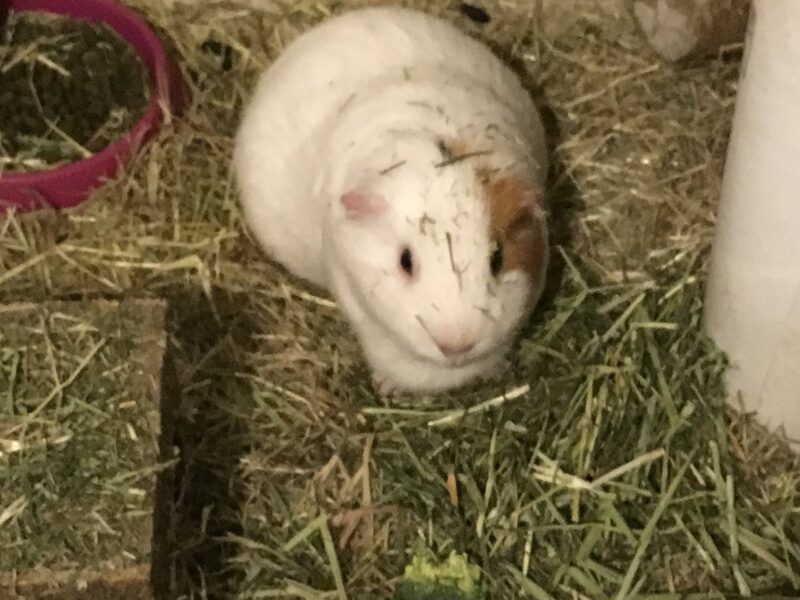 My favourite food is grass, although cucumber and hay come pretty close. Way-aye there, Roscoe here again. Hope you’re all doing well. We’ve had nice sunshine the last couple of days, and Mam hasn’t been wearing lots of clothes (plenty but not lots of woolly ones). She says it’s only February so don’t expect to go out on the grass yet. But I know there’s photos of past piggies on the grass in February, so I’m getting me hopes up. Mam is very disappointed with our diets. I think she’s disappointed with her own, to be honest, since she tries hard during the week and then she says it all goes wrong at weekends. I told her we should dole out her food, but she doesn’t listen. Mind you, this starving us hasn’t had much effect so far. It’s hard to tell though, because if you’ve just had a wee it could make you weigh a lot less. Mam’s done something clever with her pictures to give you this chart of our weight loss over the four weeks. 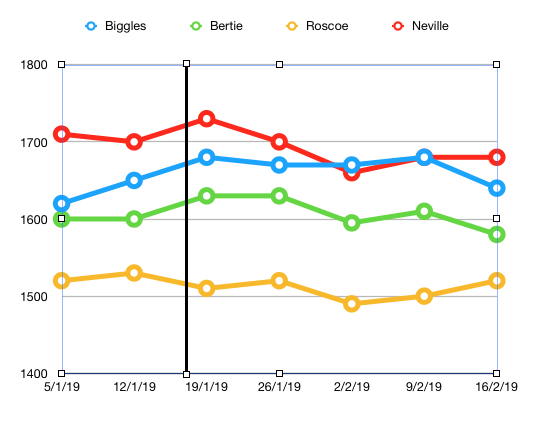 Neville’s line is at the top. You can see that after the black line that shows when we started these slimming things he’s dipped below the 1700 gms line. So maybe it’s helping him. He certainly comes and stretches up for his cucumber and things from Mam, so maybe that’s helping. The next line is Biggles. I don’t know what he’s eating, but he’s not been losing any, and Mam’s very disappointed with him. She says he’s a bit more active though. Bertie’s the next one down. If I was feeling kind I’d say he’s lost a bit in the last couple of weeks, but since he put it on to start with, he’s only a tiny bit less. And then there’s me. I’m the lightest of us anyway. Mam says that’s no excuse, I’m heavier than ‘huge Hugo’ ever was. I suppose that bursts my bubble a bit, but not much. I was doing well till that birthday party, so I reckon we can blame it all on your cake, Mam. Mam says we’re continuing with the diet till we’ve got through all the special food. Well, it’s fairly tasty when you get used to it, so that’s okay. I miss the occasional carrot though. It’s an exciting week coming up, ‘cos I’m on Furkid Friday this coming Friday. Don’t miss it. This is the link, but don’t click it till Friday as it won’t work till then. You get to meet Joshua, and he interviews me, and there are pictures, too. You’ve probably seen the pictures before, mind. 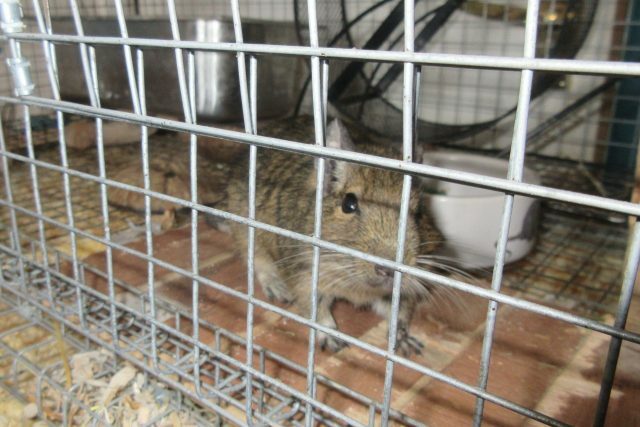 And here’s Joshua in his cage!